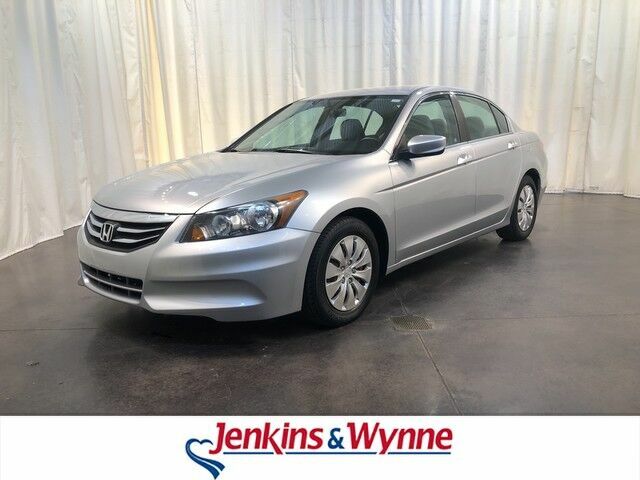 This outstanding example of a 2012 Honda Accord Sdn LX is offered by Jenkins & Wynne. Stylish and fuel efficient. It's the perfect vehicle for keeping your fuel costs down and your driving enjoying up. Gently driven doesn't even begin to explain how lovingly cared for this ultra-low mileage vehicle has been. More information about the 2012 Honda Accord Sdn: For those who want more of a performance feel, the Accord sedan is one of few to offer a manual transmission with a V6 engine. All three of the engines are refined and powerful, while base LX and LX-P models look like a remarkable bargain for those who want a reasonably stylish sedan with low running costs. The Accord maintains an enviable reputation for longevity, reliability and excellent resale value, which makes it hard to beat for those hoping to keep their car for many years. This model sets itself apart with Sporty driving feel, stylish coupe styling, and plush interior appointments on EX trims TEXT: 214.914.1866 CALL: 931.538.7505 EMAIL: Sales@JenkinsAndWynne.com. Our pre-owned come w/ an oil change, windshield wiper fluid check, 50k mile compression check, atleast a 32pt inspection sheet, the AutoCheck vehicle report, and a 12month/12k mile power train warranty (on a vehicle w/ 80k miles or less/10 years or less/ excludes Diesels, also excludes Bargain Corral Vehicles). This is already over a $200 savings to you! Jenkins & Wynne has been proudly serving the Clarksville area since 1953! This 2012 Honda Accord is a 4 door 2.4L front wheel drive sedan! This beauty has gray cloth interior, CD player, power locks and windows and more!